WONDER IS NOW A MAJOR MOTION PICTURE STARRING JULIA ROBERTS, OWEN WILSON, AND JACOB TREMBLAY! Over 6 million people have read the #1 New York Times bestseller Wonder—the book that inspired the Choose Kind movement—and have fallen in love with Auggie Pullman, an ordinary boy with an extraordinary face. The internationally beloved novel Wonder, the treasured collection of companion stories Auggie & Me, and the paperback edition of the inspirational 365 Days of Wonder: Mr. Browne's Book of Precepts are now available in a boxed set edition. 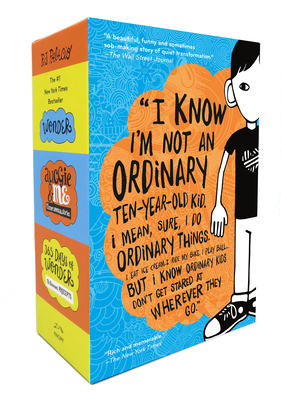 This is the perfect gift for the millions of readers who have fallen in love with Auggie Pullman, his friends, and their teacher Mr. Browne, and also for readers who have yet to be introduced to the wonder of Wonder.